The beach in the Balleno Marine National Park. Uvita Beach is a small dozy village where most of the accommodations are built in the mountainous parts of the rainforest. From here one has an excellent view of Balleno Marine National Park. South of Uvita Beach and Punta Uvita the river Uvita flows into the Pacific. 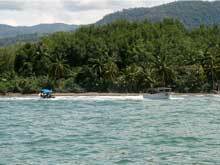 This bay has a beautiful sand beach and the waters are excellent for swimming and snorkeling. The offshore reefs offer a natural habitat for many animals and plant species. Uvita Beach is also famous for the whale's tail sandbar formation , which forms everyday during low tide. 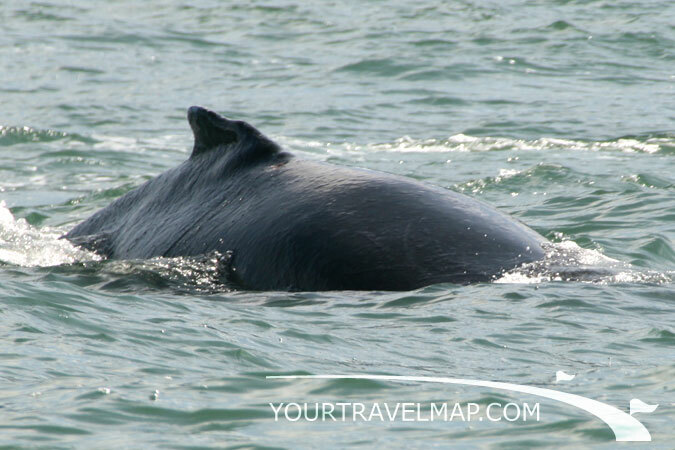 On whale watching tours you can observe the humpback whales in their native environment. 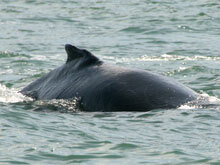 The best chances to spot a whale in Balleno Marine National Park are during September, February and March. 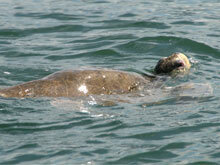 During July through January sea turtles come to the beach to lay their eggs in the sand. 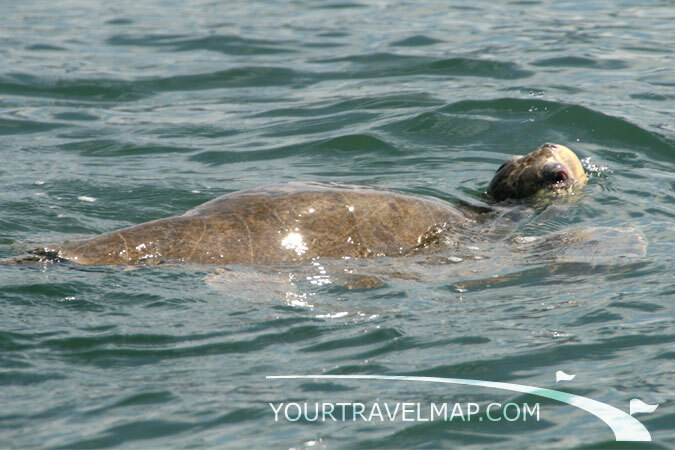 The Balleno Marine National Park offers many opportunities to observe sea turtles in their natural habitat. Inland the terrain rises and is a paradise for nature lovers, animal observers and horseback riders. Birds and monkeys can easily be observed in their natural living space. There are plenty places to swim in one of the streams or swimming holes. 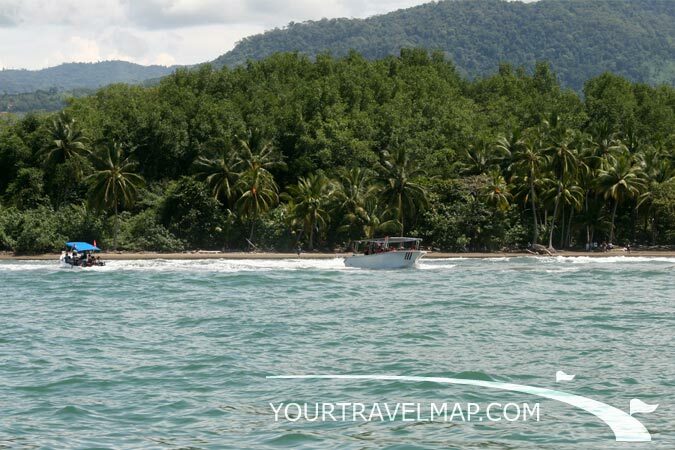 Uvita Beach is located in the province of Puntarenas. Distance from San Jose to Uvita Beach: 233.7 kilometers respectively 145 miles. Travel time from San Jose to Uvita Beach: 3.58 hours. Distance from Liberia to Uvita Beach: 315.8 kilometers respectively 196.1 miles. Travel time from Liberia to Uvita Beach: 5.26 hours. Birdwatchers should also make a trip to the mangrove swamps on the coast but watch out for caimans and crocodiles. Uvita Beach has its own airstrip, seeing the rainforest from a birds eye view is a unique experience.